Our customers love the brilliant colors and patterns that their Entry Brite stained glass front doors bring to their homes. It can turn a dull entryway into a brilliant fresco. Since we make custom stained glass treatments, you choose what colors you would like in your stained glass. We all have a favorite color, and you might like to use it on your new stained glass front door, but do you know the psychology behind that color? 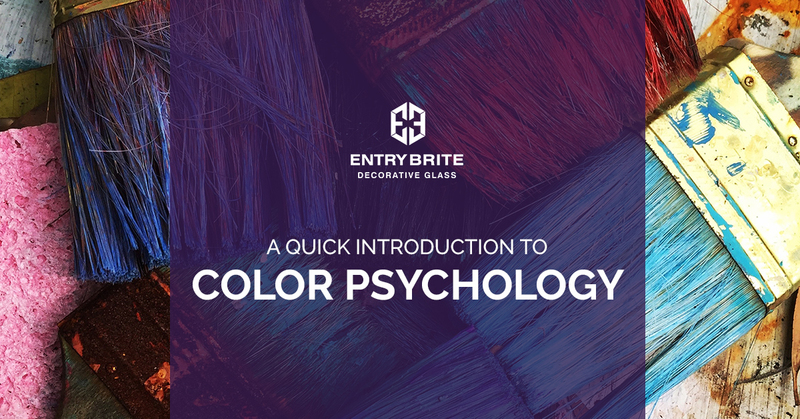 Join Entry Brite of Las Vegas as we discuss the psychology of some of the most popular colors. Red is a powerful color, and is often associated with aggressive feelings and ideas like energy, war, danger, power, as well as more passionate feelings like love, desire, and courage. Red is the longest wavelength of light, making it pop wherever it’s used. This popping effect makes objects that are red appear closer than they actually are. Red can be perceived as friendly and inviting, or aggressive and demanding. Blue is a very calming, passive color that can be used to create a soothing effect. The color blue is said to stimulate thought and softer colored blues can even aid in concentration. Blue objects, unlike red ones, appear farther away. This might be why some perceive the color blue to be a cold and removed color. Blue is routinely rated as the world’s favorite color by researchers. Yellow is the most energetic of all of the colors. It is associated with feelings of joy, cheeriness, and optimism. The color yellow helps to lift your spirits and improve your mood. It is also a great way to draw attention to something, as it is a vibrant color, hence why taxi cabs and road signs us this color. However, if there is too much yellow on an object, it can cause a disorienting effect. In some cases, the wrong shade of yellow, paired with other colors, can distract from the visual appearance of an object. Green is seen as a balanced color. It shares its shades with nature, and many feel that the color green helps to bring them a sense of harmony, relaxation, and awareness. It is strongly associated with a sense of safety and stability. Of course, it can also lead to a sense of stagnation and decay. It’s strong association with money leads some to feel energized by this color, while others are turned away by its feeling of greed. Green is draws the eye quickly and the right shades hold people’s attention. Orange is a stimulating color. As a mixture of red and orange, it stimulates both a physical and emotional reaction when it is viewed. This color is associated with a feeling of enthusiasm, youthfulness, and determination. It also stirs up feelings of physical comfort, like the reassurances of food, shelter, and warmth. However, it’s perception as a “fun” color also lead others to perceive it as a frivolous color that lacks seriousness. While it can represent comfort, when paired with other bold colors it can represent a sense of deprivation. When you help design your custom stained glass front door, keep in mind the psychological impact that your color choices might have. They might have a greater effect on your friends and family than you might realize. You want your home to feel warm and inviting, so you’ll want colors that match and promote that sentiment. Bring beautiful colored light into your home. With our stained glass doors and windows, you can completely transform the experience of your living space. 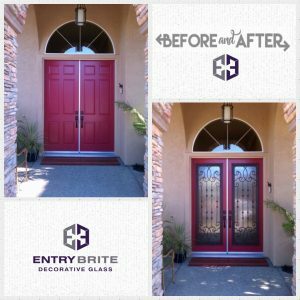 Contact Entry Brite today to get started on your custom made stained glass front door!